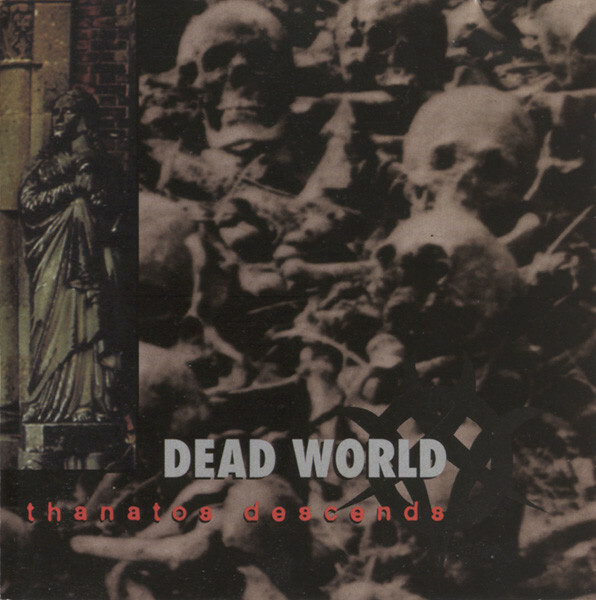 "Thanatos Descends" by Dead World would be the heaviest industrial metal album of all time if... if it would be a full album, and without the experimental music noises. Even though in lenght it's a full-lenght record for sure, the five noise tracks were not made by Dead World, and they doesn't really fit to strongly death metal influenced rest of the album. Or it's like a full-lenght split album with mixed up songs. Their purpose was maybe to create contrast, but it didn't work out so good, and sounding like time fillers only. The listener may stay unsatisfied because of the lower amount of heaviness, especially because Dead World reached it's maximum in sound compared to the previous albums. "Thanatos Descends" is noisier and very harsh. And similar to "The Machine", it seems like to sound very intense is not up to the speed, songs never getting faster than slow/mid speed, but still they are very effective and catchy. This is one of the most evident Godflesh influences, and from the plenty of their followers, Dead World operated with the speed the best way. The role of industrial influences decreased from the songs, but these seemed like to concentrate in the "Thanatos" titled noise tracks. In too high concentration unfortunately. But there are 4 songs at least which are far closer to define industrial death metal, than any previous tryings before, including even Meathook Seed or Soulstorm.